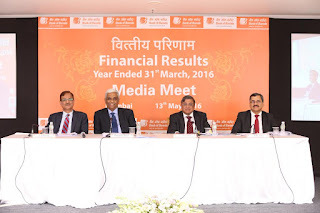 Bank of Baroda announced its audited results for the Q4 of FY 2015-16 (Q4FY16) following the approval of its Board of Directors on May 13, 2016. The Bank’s Total Business stood at INR 9,57,808 crore as on 31st March 2016. Total Deposits were at INR 5,74,038 crore as of March 31, 2016 as against INR 6,17,560 crore as of March 31, 2015. Corresponding figures for Average Deposits (based on daily averages) were INR 5,78,317 crore and INR 5,34,470 crore resulting in growth of 8.20%. Total Domestic Deposits on average basis (based on daily averages) grew by 11.49%. CASA (Domestic) deposit on average basis grew by 11.95% on y-o-y basis. Share of domestic CASA deposits stood at 33.48% as of March 31, 2016 and on a daily average basis domestic CASA stood at 29.50%. Total Advances (Net) were INR 3,83,770 crore as end of March 2016 against INR 4,28,065 crore as end of March 2015. Average Advances (Gross-based on daily averages) were INR 4,05,126 crore and INR 3,83,313 crore respectively; resulting in average growth of 5.69%. Domestic Advance grew by 6.43% on y-o-y basis. Retail Advances stood at INR 50,850 crore and constituted 18.1% of Gross Domestic Advances as on March 31, 2016. Within the Retail Advances, the home loan portfolio increased by 10.77% to INR 24,968 crore. The Bank’s International Business continued to occupy a significant position. As at March 31, 2016, the Overseas Operations contributed 31.29% to the Bank’s Total Business. The Bank’s Total Income stood at INR 12,789 crore in Q4FY16 with y-o-y growth of 6.07% and Net Interest Income stood at INR 3,330 crore (y-o-y growth 4.98%). Other Income increased by 37.07% to INR 1,775 crore driven by trading, exchange gains and FX profits. The Bank’s Total Expenses grew by 9.11 % (y-o-y) to INR 10,217 crore in Q4 FY16. Gross NPA of the Bank stood at INR 40,521 crore as on Marchh 31, 2016. The Gross NPA ratio stood at 9.99%, while the Net NPA ratio stood at 5.06%. Total Restructured Standard Assets of the Bank decreased from INR 17,135 crore as on December 31, 2015 to INR 13,735 as on March 31, 2016. Provisions and Contingencies (excluding tax provisions) made by the Bank stood at INR 6,858 crore in Q4 FY16. Provisions against “NPAs/Bad Debts written off” stood at INR 4,880 crore in Q4 FY16. Provision Coverage Ratio (PCR) of the Bank improved to 60.09% as on March 31, 2016 from 52.70% as on December 31, 2015. The Bank’s Operating Profit was INR 2,572 crore in Q4 FY16 as against INR 2,694 crore in Q4, FY 15. Its Net Profit for Q4 FY 16 stood at (-) INR 3,230 crore. 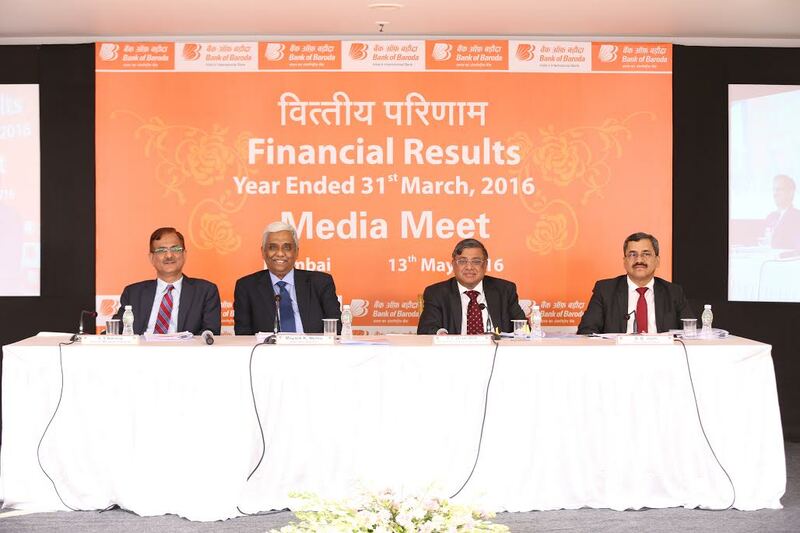 For FY 16, the Operating Profits was at INR 8,816 crore as against INR 9,915 crore in FY 15. The Net Profit must be read in the context of additional one time provision of Rs.4464 crore that has been taken in Q4 FY 2016. The additional provision has two components. First provision for credit loss by INR 2,900 crore and this provision is over and above the credit loss provision required as per RBI norms. This has been taken to improve the provision coverage ratio. The second component is provision of INR 1,564 crores for pension liability and which has arising on account of the shift in mortality table. The CRAR on standalone basis (Basel III) has improved to 13.17% as on March 31, 2016 from 12.18% on December 31, 2015. Out of this, the Tier 1 capital was 10.79% and CET 1 Capital was 10.29% as on March 31, 2016. CRAR on a consolidated basis as on 31.3.2016 was 13.63%. Commenting on the Bank’s performance, Mr P.S. Jayakumar, Managing Director & CEO, Bank of Baroda said, “The year 2015-16 has been one of transformation addressing NPAs. We are excited by the transformation journey we have embarked on, which will give us leadership position in the banking and financial services sector. Bank of Baroda is one of India’s largest banks with a strong domestic presence spanning 5,330 branches and 8,975 ATMs supported by self-service channels. The Bank has a significant international presence with a network of 106 branches/ offices subsidiaries, spanning 24 countries. The Bank has wholly owned subsidiaries including BOBCARDS and BOB Capital Markets. Bank of Baroda also has joint ventures for life insurance with IndiaFirst Life Insurance and for asset management with Baroda Pioneer Asset Management. The Bank owns 98.57% in Nainital Bank. The Bank has also sponsored three Regional Rural Banks namely Baroda Uttar Pradesh Gramin Bank, Baroda Rajasthan Gramin Bank and Baroda Gujarat Gramin Bank.